A new set of Mini Modulars have been discovered from LEGO’s instruction database! The last time we had something similar was LEGO Mini Modulars (10230) from 2012. Each set comes with microscale building on an 6×8 plate and 2 vehicles. The new buildings are movie theater, pizzeria, fire station and town hall. They’re able to connect together to form a city block. Unfortunately, these are a smaller scale than the old LEGO Mini Modulars (10230) which were built on 8×8 plates. These sets will be available exclusively at Toys R Us during their Bricktober promotion in October. 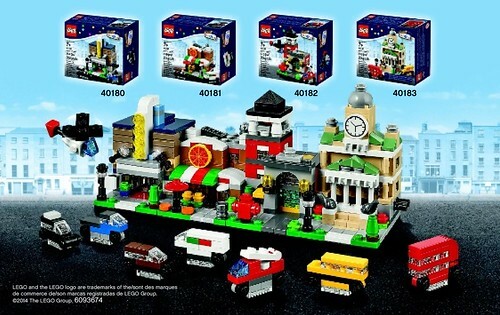 If it’s similar to previous years, one set will be available each week for free with a minimum LEGO purchase amount. Last year, you had to spend $60 each week so expect something in that range this year. These sets are rumored to be US exclusives. We will need to wait to see if they will be available in Canada. I like them, though I doubt I've got the cash to be able to collect them all. I saw pictures of US TRU Stores having the sets for sale for $19.99. I wonder if they will be on shelves in Canada. Brickcetra wrote: I saw pictures of US TRU Stores having the sets for sale for $19.99. I wonder if they will be on shelves in Canada. Was each one $19.99 or the whole set? $20 for one seems a bit steep! They always have messed up values for their free stuff.